Greg took his very first yoga class in 1999 with My Health owner Carrie-Anne here on the Gold Coast and was immediately drawn to My Health Yoga’s style of spiritual, well rounded and authentic yoga teaching. 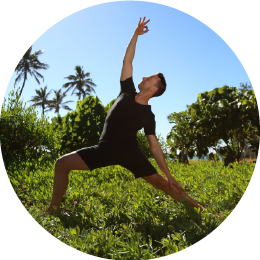 Formally a professional dancer, Greg completed his first Teacher Training program with My Health Yoga shortly after and immediately developed a love of sharing yoga. After retiring from his performing career, Greg completed a BHSc (Acu) and is a registered Doctor of Chinese Medicine (CMBA) as well as a well respected and well-known yoga teacher on the Gold Coast. Greg is a facilitator of many MHY training courses both in-studio and online.